Robert F. Dorr and Thomas D. Jones are veteran writers and former military men who collected information and memoirs from the men of the Ninth Air Force, 365th Fighter Group, who flew P-47 Thunderbolt planes. Hell Hawks! 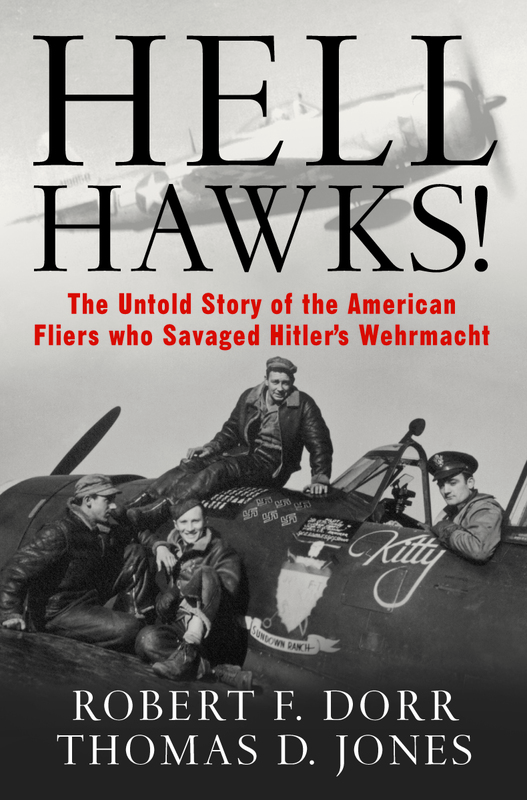 The Untold Story of the American Fliers Who Savaged Hitler’s Wehrmacht tells their story in a highly readable fashion. The 365th was composed of three squadrons of fighter-bomber pilots fresh out of flight training, who flew in close support of the ground forces as the Allied forces entered France on D-Day and advanced across France, Belgium, and on into Germany. They had one mission, and that was to harass and destroy anything that looked Nazi. The P-47 Thunderbolt was a big, stable plane that held up remarkably well, no matter how much flak was thrown at it. They flew on D-Day, providing air support and dropping 385 tons of bombs on anything that looked like a target and strafing anything that moved. Every day of the European campaign, the Hell Hawks flew their missions, and kept flying them until the war ended. This book tells the story of those fighter pilots and what it took to keep them in the air. My father, Mitchell M. King, Jr., a “civilian pilot” and a Hell Hawk in the 388th Fighter Squadron, found himself captain of one of the ground crews whose responsibility it was to keep the planes in repair, the runways ready, the and the pilots ready to fly. One of his favorite tales was the day the pilots ate a rice pudding dessert the night before and fled the mess hall during breakfast the next morning. He spent his day carrying soup to the pilots as they lay ill in bed, in a vain attempt to get them ready to fly the day’s mission. (My father rarely ate much and had given the rice pudding a pass.) The pilots could not fly the mission, the “Brass” descended on the outfit, and the cook was busted and reassigned. This book is extremely readable and tells the tale of these ordinary men who found themselves in an extraordinary situation, and in true American fashion, they made the best of it. Mr. Dorr & Mr. Thomas interviewed many of them, including my dad, for as Mr. Dorr says, these men are fading away rapidly now, and their biannual reunions are much more sparse. This is the story of hometown heroes, who did extraordinary things during their youth, then returned home and reared families and lived ordinary lives. I recommend Hell Hawks! to all who enjoy World War II history. My father died in 2010 at the age of 95, and he had already outlived many of the younger men in his outfit (he was drafted at the ripe old age of 26). I am thrilled that these men and their deeds have been recorded in this exciting book.